Roots Africa Tours offers comfortable, air-conditioned private airport transfers, led by South African Tourism registered guides. Contact us and let us arrange a convenient pick up with one of our experienced drivers. 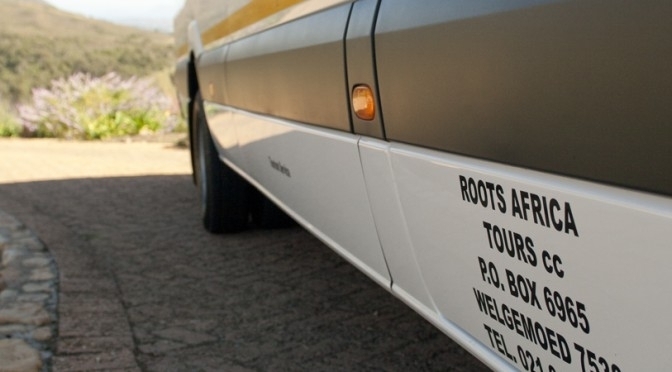 Roots Africa Tours offers comfortable, guided tours in luxury, air-conditioned vehicles, led by South African Tourism-registered guides. Operating seven days a week, the company also offers various other options, including a tailor-made itinerary. 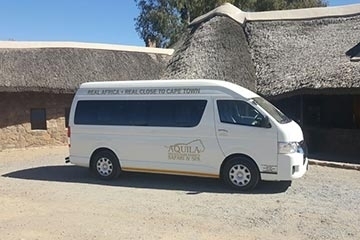 Aquila offer schedule departure mini-bus transfer services from most CBD hotels to the reserve. This is an economy class option, sharing with 10 guests and offering day and overnight options. Standard transfers have no minimum pax. Minimum pax applies to private, luxury and air transfers. Transfer times are estimated as external conditions may impact times. Flight times are per route and not time. Vehicles of aircraft type might change due to availability or number of pax. Standard cancellation policy applies. Transfer rates exclude safari options at Aquila. A minimum of 2 pax apply to all options of transfer and travel / flight times are estimates as travel is per route, and not time. Aircraft and vehicles may change due to availability or number of pax. Helicopters are operated by Silvercross SX. Flights are weather dependant and may be changed to road options should flights be cancelled. Standard payment and cancellation terms apply. In the unlikely event of a cancellation of a booking, travel insurance must cover our cancellation terms. In the event of any flight delays or cancellations, Aquila Private Game Reserve is in no way responsible for any loss whatsoever. Please ensure adequate travel insurance is taken out to cover any eventualities. Aquila Private Game Reserve, offering big 5 safaris two hours from Cape Town, makes it easy for you no matter what your time constraints are, we offer half day, full day and overnight safari package options! Franschhoek Wine Tram offers an exclusive and direct door-to-door transfer service from Cape Town and surrounds (including the airport) out to Franschhoek. Transfers are private to each booking, include a return transfer and can be arranged to accommodate an extended stay over in Franschhoek at no additional cost. Transfers start at R550 per person which includes return transfer (based on two people booking) and can be added during the booking process to any of our experiences. City Sightseeing now offers an all-inclusive Franschhoek Wine Tram experience which includes both transfer and tram tickets for R470 per person. This service runs on Tuesdays, Thursdays and Saturdays each week. 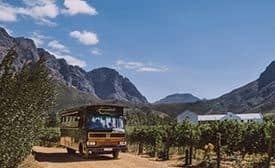 The Franschhoek Wine Tram hop-on hop-off tour is one of the best ways to discover the true essence of the Franschhoek Valley – picturesque vineyards, breath-taking scenery, warm hospitality, world-class cuisine, fine wines and a 300 year history.